In recent times it is rare to have the opportunity to come in contact with free ranging whales and dolphins in the open ocean. In April 2008 on La Gomera, one of the Canary Islands, some people came together with the intention of creating the possibility of this experience for more people of all ages. Because whales and dolphins have extraordinary hearing, we will use the medium of music (live music) to bring us into deeper contact with them. We already have experience of doing this through the work of the project “Kairos- Human Dolphin Research” during the years 1993-98 (www.ulisses.de/kairos). We organize boat trips, which will start and finish in the south of Tenerife. Than we sail to La Gomera and possibly to La Palma or El Hierro. In this area about 20 different species of whales and dolphins have been seen; from the small, friendly and playful Atlantic Spotted Dolphin to the Bottlenose Dolphin and Pilot Whale to the Sperm Whale; even a Blue Whale once has been sighted here. Samyo, the skipper, has worked for 15 years with these creatures and has developed a great deal of experience and empathy with them. 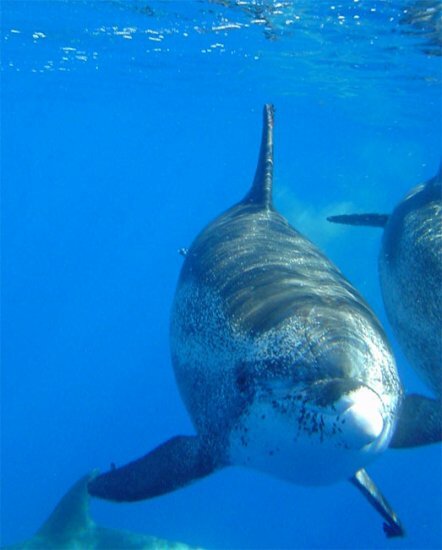 There are two audio-cd`s available, one with live recorded musical interactions among whales and dolphins and humans, one with pure whale- and dolphin sounds.